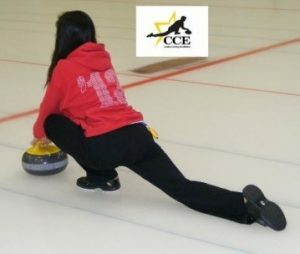 For years we have been using two rocks to help Little Rockers, Learn to Curl participants, Juniors and even adult curlers with their delivery balance and technique. Unfortunately, more often than not, the rock in the right hand floats out to the right, away from the line of sight (as seen in the picture) and not in front. This technique leads to poor balance initially and a reliance on the rock(s) for said balance. It also can develop shoulders and body not being square to the target and having your participant leaning to the right or left depending on sliding foot position and amount of weight he/she is putting on either rock. As a result, a participant’s whole body is on one line establishing better balance and control. From an instructor’s viewpoint, it is easier to explain where and why we have our hands and feet in certain spots. Then when we have a curler remove their left hand from the rock, as if they were holding a broom, everything remains in line. 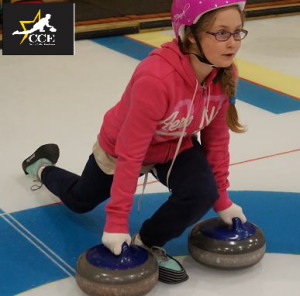 The CCE has been using this delivery technique for ALL ages. 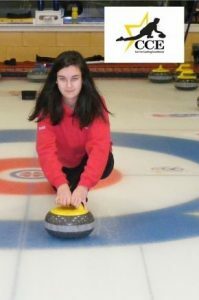 It has been very successful and well accepted by the curlers, beginners and more experienced alike. 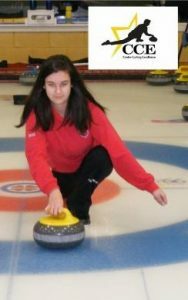 It has even helped curlers who have been using a stabilizer, glider or crutch because good balance and form was obtained more quickly.